This week’s violence at Berkeley would seem to support the conservative claim that the truly violent political group in America is not gun-toting conservatives, but protesting progressives. But the question remains – what subgroup among progressives is behind all of the violence? Is it part and parcel of mainstream progressivism, or are darker forces on the fringes being passively allowed to infiltrate progressive rallies? 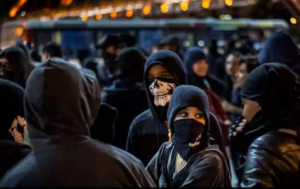 Black Bloc, is a tactic, not a group. Those who practice it often wear black and cover their face with masks. They usually leave a wake of destruction. Let’s assume that this lets Progressives off the hook as far as being directly responsible for violence at their rallies (it doesn’t). Why is it that anarchists seem to find a home among progressives? There are at least four reasons why anarchism has become a hallmark of the the left and not the right. If you view politics on a single axis from left to right, you might go from Statism to Anarchy, where anarchy is the last step to the right beyond Libertarianism. While this overly simplistic chart is technically correct that libertarians are oriented towards small government, and anarchists are to the right in this measure, for some odd reason anarchists don’t really find a home among modern American conservatives, but they do on the left. So anarchists can easily fill this vacuum without having to compete with the arguably more reasonable and balanced Libertarians of the right (and I will also mention that Libertarians don’t all like being linked with social conservatives – they truly are “between” left and right in many ways). While conservatives are trying to conserve what works, they also end up conserving power structures and rules that don’t work. Classical liberalism wanted to use reason to ditch outdated thinking, but this healthy emphasis, coupled with the abuses of power of conservativism, led from merely bucking tradition to an adoption of a strong anti-authority view. Anarchists are anti-authority as well, and so find congruence with the modern progressive dislike for authority, and willingness to go beyond words to protests and disrespect of authorities. By contrast, though there are many conservative pundits who also display a disrespect for those in office they disagree with, there is still a strong respect for authority, especially the military and law enforcement among conservatives, which goes against anarchists tendencies. Progressives in principle (though perhaps not practice!) are geared away from such ideas as just war, gun ownership, and vigilantism. Coupled with at least a measure of comittment to non-violence and tolerance, when violence does erupt in their midst, they are not ready to resist or limit it in a timely and complete manner. In fact, their overemphasis on tolerance has in many ways caused them to cease being able to discern where proper limits and balances are, since the only real sin among them is INtolerance. If we accept everyone, by what principle do we shut down the violent? This inability is also exacerbated by a previous commitment to excusing the violence of oppressed minorities whose oppression has been disregarded for too long. So when real violence attends their rallies to besmirch their cause, they are just not prepared. Their dislike for law enforcement and guns and love for statism paradoxically makes them dependent on the state to curb their violence. Worse, when inevitable harm does come to violent protesters at the hands of law enforecment, progressives can now conveniently blame the system for injustice. By contrast, try to start some racial or other disturbance at a Tea Party rally and you will find out how prepared the right is to re-establish law and order, and support our military and police. Both right and left would like to own the great legacy of Dr. Martin Luther King Jr., and nothing is more impressive than the many occasions on which Dr. King preached love, prayer, and patience in the face of violence from the state. They are a distorted form of social protest. Modern progressives confuse planned marches that violate unjust laws with intimidating fellow citizens by blocking their paths (blocking traffic), and justifying rather than just understanding, as King did, the looters and vandals. Anarchism and its accompanying violence and chaos is and will continue to be a part of Progressivism because the factors above are too entrenched to be corrected. This is why liberal rallies, while intended to be peaceful, will always harbor the greater possibility of violence. 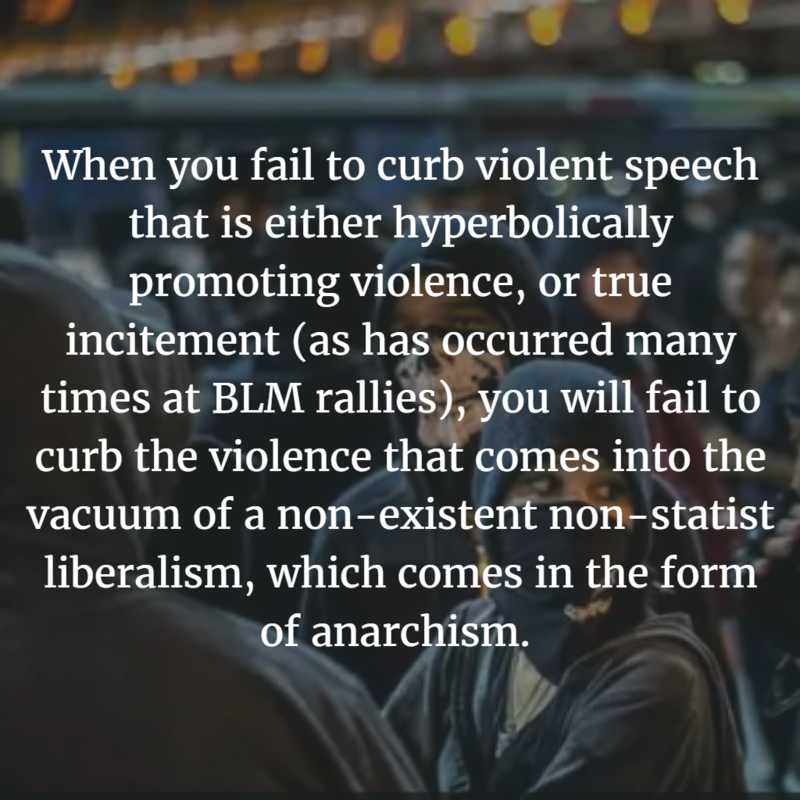 When you fail to curb violent speech that is either hyperbolically promoting violence, or true incitement (as has occurred many times at BLM rallies), you will fail to curb the violence that comes into the vacuum of a non-existent non-statist liberalism, which comes in the form of anarchism.